Are you a front-end developer or a passionate designer ? Download Volcan-a free portfolio HTML5 Bootstrap template to build your portfolio site. Nowadays, many people can design and develop websites. Ten years ago, things were different back then. Only a handful people were able to get in the ride. Now, people have direct access to the learning – from elementary algebra to rocket science. Learning web design has become accessible, resources are available, the community is growing & helpful. So how you are going to stand out from the crowd? You need to prove why someone will spend their money on you to get the quality work. How to ensure people that they’re going to get what they want? You need to show something. The World has changed, people don’t believe what you say; instead, they love to see what you did. They need to know your story. Design a portfolio website is a must. Volcan (we don’t know why we give this name!) – a free portfolio html5 bootstrap template will save your time. It will let you develop a portfolio website quickly. The design is different and unique which means people will notice you instantly and remember you for a long time. all those kind of template, Volcan meet the standards and can please you all. Any improvement or modifications to this free HTML5 Bootstrap template for portfolio website are warmly welcomed. You don’t want your clients to leave your portfolio site quickly, neither do we. The portfolio layout of the gallery is designed according to this philosophy. When someone clicks on any of the portfolio items, they will see a lightbox having an image or screenshot of your creative portfolio. They can click next and check more. This way your potential clients and visitors will get a clear idea about your work without leaving your website and check your actual project. See, you make them happy having this outstanding layout technique. You are the owner of a portfolio website having the best logical user experience (UX). So you know your potential customers are happy with your work. They now want to contact you for the further inquiry, or they want to start a new project with you. Having a contact form on each page will leverage the possibility of making a connection between you and your clients. 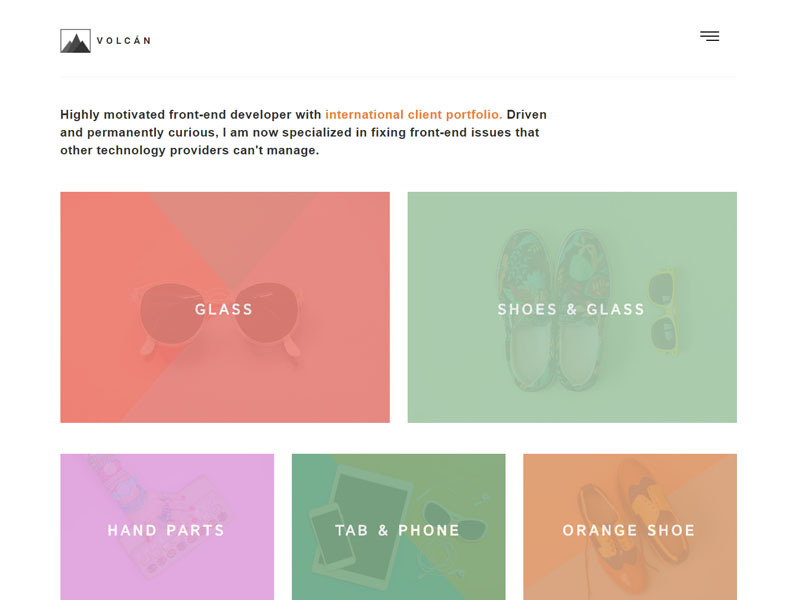 Volcan, the free portfolio HTML5 Bootstrap template has it right for you. See yourself. Still, if you want something more and have a suggestion for us, please comment in the below part of this page. We will solve or improve the template as per your request. I hate to sound like a marketing guy, but this is what we are good at – making things better, do what is right! The feature list can be as long as the template. So let me keep it short. Here are some key features. Mobile Friendly Responsive Layout – This is a perfect example of a mobile friendly responsive portfolio website. The template is based on Twitter Bootstrap. Bootstrap made it easy to make the template mobile friendly. The elements, contents and layout fit well even in your smallest handheld devices. There are many predesigned elements in this free portfolio HTML5 Bootstrap template which will be helpful for you. The list will be more if you put your thought on which HTML5 or Bootstrap elements you want us to add. Let us know if you want something more elements on this free HTML5 template. We appreciate your thoughts and suggestions in advance. It’s you who decide if this template is good or bad. But honestly, we know you can showcase your passion with this free HTML5 Bootstrap template. Show the world what you have done. [Bonus] How to Design a Portfolio Website for free? Well, thanks for asking. There are few ways how to create a portfolio website for free. Especially when you don’t know web design or coding or know a little bit. Step 1: Buy a domain you love and a server where you will keep your website files. Step 2: Download Volcan, a free portfolio HTML5 Bootstrap template. Step 3: Download a code editor. Step 4: Open the template in the editor and change the content; add your text and images. Step 5: Upload it to your server. That’s how you actually can design a portfolio website for free. Isn’t it cool? If you face any problem customizing this free HTML5 template for your portfolio website, don’t hesitate to comment here. The design layout is so nice. This is a beautiful template, however, the Contact Form doesn't work and doesn't respond to any editing. It is a very customizable template that provides flexibility and a good design code.